Clips from analysis used on the live stream of the Australian Ultimate U22 Nationals Finals, plus unseen extras. Also check out 37 second clip / summary of this video if you’re pushed for time! 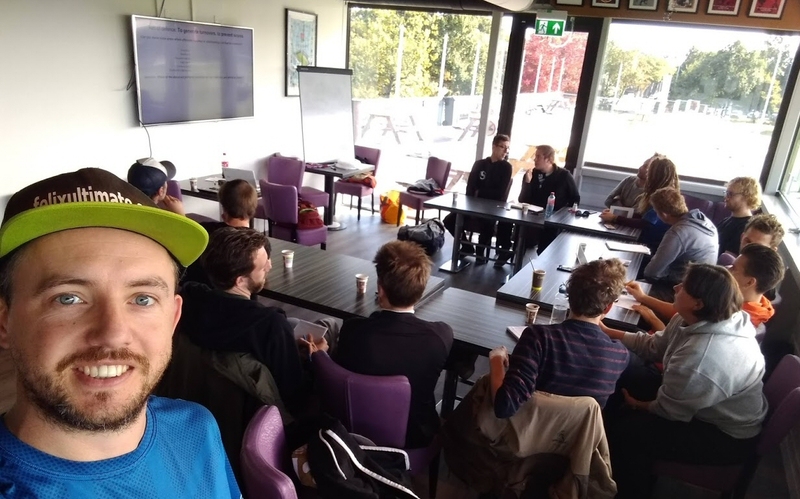 Last weekend saw players from all over Netherlands and Belgium come together to learn Hex Offence and Flex Defence at the Amsterdam Hex Clinic, put together with help from Sjoerd Druven. The clinic started with a classroom session on Flexagon Defence theory – the group discussed common offensive mistakes and shortcomings, and thought about which were the most noticed, and which are rarely considered to contribute to turnovers. 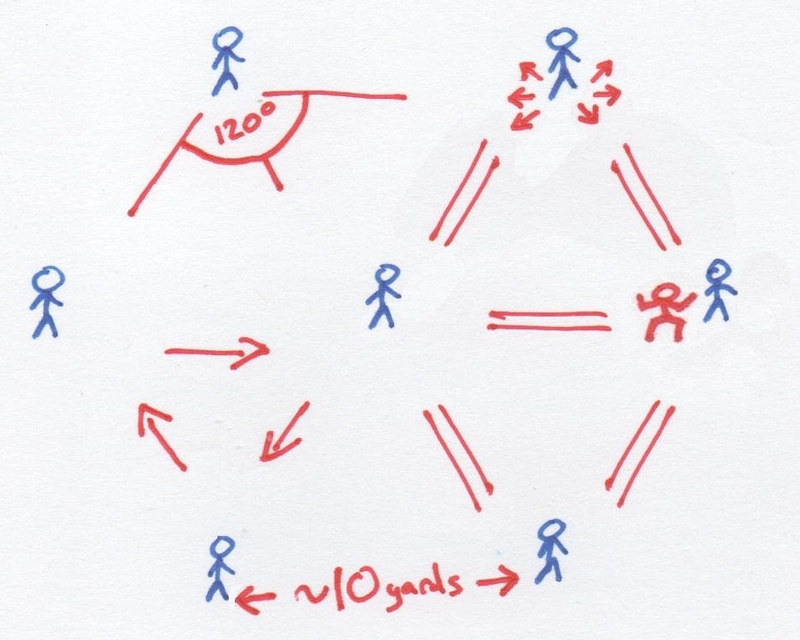 Then we looked at how defence could change to take advantage of the less noticed offensive shortcomings, and how such a defence could be trained. We headed out onto the field after lunch to put into practice what we had been talking about – running a few drills without a disc involved, focusing on defensive movement. Here are clips from Trent’s Drill (credit to Trent Simmons from 10milliondiscs.org) and the Surrounding Stack Drill, which aim to get players used to moving and reacting to multiple offensive players in a group, rather than just 1-to-1 marking. Casper / ulti.tv filmed the first outdoors session, so when we went inside we were able to immediately use the footage for video analysis! This was really beneficial to everyone – to be able to replay exactly what happened and consider alternative actions is a great way to learn quickly. After the analysis session we headed out again for the Triple-Sandwich drill, and more games! Saturday night we had a meal at a Turkish restaurant and played some Dobble before going out for a couple of drinks & then back to Sjoerd’s house (picturesque – next to a canal). 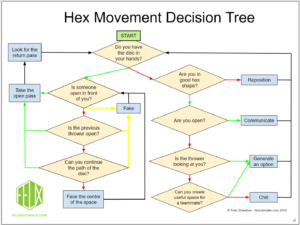 Sunday was Hexagon Offence day – starting again with a classroom session where we looked at the history of offence, broke down the shared fundamental elements of offence, and looked at how different offensive systems prioritise different values – and how Hex fits into the picture. 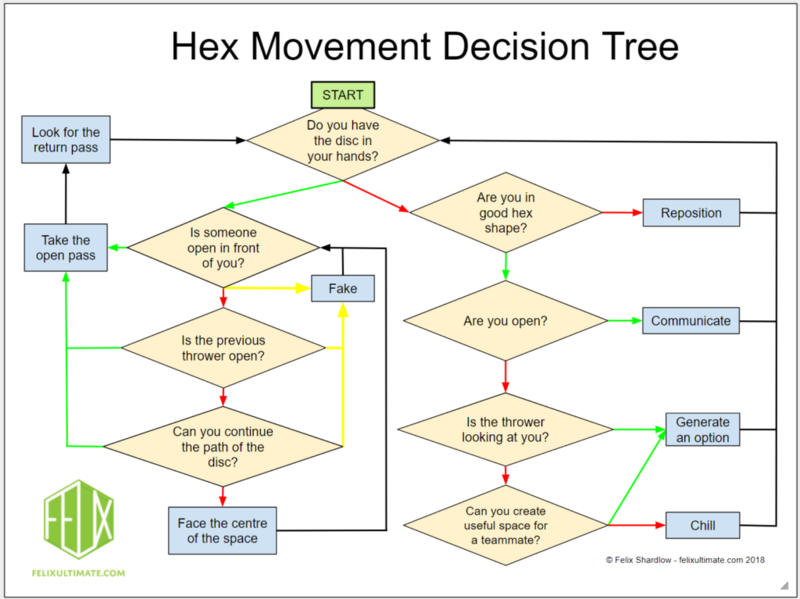 Hex, which values flow above all else, was explained through Movement, Shape, and Technique – each of which are very different compared to conventional stack offences. After everyone got some practice building shape, we went into games, and the offence worked smoothly – it was tough to defend against and everyone was discovering new throws and movements in the fast-moving style. The most common feedback was that it was surprisingly good FUN to play! Ulti.tv were filming again, so we were able to go inside and immediately have an analysis session. During this session I noticed that everyone was analysing their own play – I didn’t really need to contribute much because the theory knowledge from earlier was being put into action, and everyone could see what they could do better in any situation, and what was working well. Although it was quite a light turnout this time around, we had 7v7 and I felt the clinic was a huge success. Everyone understood the theory, implemented it well, saw another side of ultimate strategy, and many players said they were keen to take the O/D back to their teams. I learnt more about how to teach the strategies and implemented a few new drills with great success. Most importantly though, everybody had FUN playing Hex & Flex! Oakland’s coach Valerio got in touch about reviewing some footage of his team. They play conventional offence and defence – here is an excerpt from a Live Streamed Analysis session I ran with them.